The thrashing never woke him up anymore. He’d grown too used to it. That bothered him. In the past, he’d been able to apply a gentle prod or a soft murmur, even if he pretended to be asleep afterward. Now he didn’t wake until he heard the loud thump indicating Domerin had run into one of the doorways on his way out or back into the room. This time, his eyes cut through the darkness to find Domerin laying in the doorway leading to the living room. It was the third time this week he had misjudged his distance from a doorframe. His bruises had to have bruises by now. Unfolding himself from his favorite loaf position, Crescent hopped off the bed and padded across the room on all fours. It was easier and made it less likely he’d bump into something on the way. He nosed Domerin lightly, but the man was already pushing himself into a sitting position. “You can turn on the lights, you know, it won’t bother me.” It was the same thing he always said. He already knew what Domerin’s response would be. How long had Domerin been up this time? Had he gone to the kitchen to get something to drink? Or had he spent the last three hours in his office trying to make himself tired all over again? How bad had the nightmare been? Crescent bit the inside of his lip to keep from saying something he knew would upset Domerin. He waved one hand in the gesture the man had taught him, summoning a dim stream of light from the ceiling. “Maybe we should rig some kind of new night-setting for the hallway.” He tried not to let concern cloud his features, but he could tell by the way Domerin set his jaw that he had failed. “You won’t be saying that when you run head-first into a wall and give yourself a concussion.” But Domerin must not have found it funny because the man glared daggers at him as he pushed himself to his feet. Crescent followed, crossing back to the bed on two legs this time. He settled on the edge, watching as Domerin eased himself down, sitting with the same rigid posture he always did. “What?” Domerin grunted after several long moments of silence. Crescent hesitated. How many times had they bordered on the edge of this conversation? 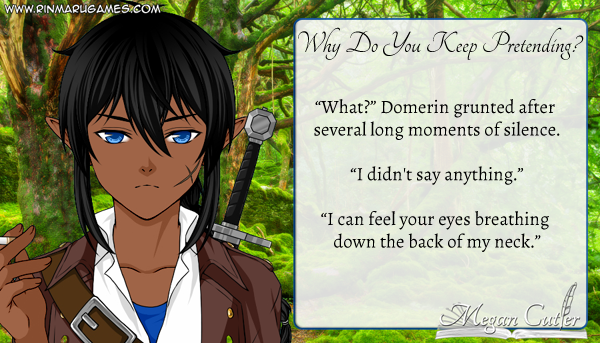 How many times would it take before Domerin told him the truth? “That’s really all you want to ask?” Domerin sounded annoyed. The last thing Crescent wanted was to awaken his anger. But he was torn between wanting to soothe the man’s hurts and not wanting to argue. Crescent clenched his teeth so hard he feared he may have cracked one in the back. The fur on the back of his neck stood on end. It was hardly the first time Domerin had used such a forceful tone against him, but after enduring it twice this week already, he felt less inclined to put everything aside. His heart pounded in his chest, his fight or flight instinct buckling down. It was time to fight. “When are you going to drop the act?” he growled, each word pausing to rumble in the back of his throat. Domerin straightened. It was difficult for him to twist on the bed, so Crescent understood why the man turned his back to him for so long before he gathered himself into a new position, no less rigid, but it made it easier for them to make eye contact. Crescent sat in silence for a moment, letting the revelation wash over him. It had never occurred to him to think about it that way. As far as he knew, two-legs encouraged each other to talk about everything that bothered them. It seemed to be their cure for every ailment. And in truth, it had done a lot of good for him so far. Talking about things had led to finding solutions to problems, where as avoiding conversations had led to complications. But he could see now how he had oversimplified the lesson. Two-legs lived in a complicated society. They required communication in a way his people hadn’t. But one couldn’t hunt prey by talking about it, even if one could learn more about the process that way. Crescent nodded. He had learned to wear many different masks since he came to live among the two-legs. The biggest and most important mask had been learning to look, act and think like the two-legs themselves. But he had smaller masks, designed to hide his personal feelings from those he didn’t want prying. Though he never wore masks in Domerin’s presence. Not anymore. Domerin’s pointed look made Crescent’s heart sink. How could he have overlooked something so critical? “You shouldn’t,” Domerin agreed. But when the man let his fingers trail down the kattar’s cheek like a feather caught in the wind, Crescent knew the rift had been mended and all had been forgiven. Please take a look at what my writing partner did with this prompt.